Club Med Bintan Island, located just off the south coast of Singapore, is undergoing an on-trend makeover. 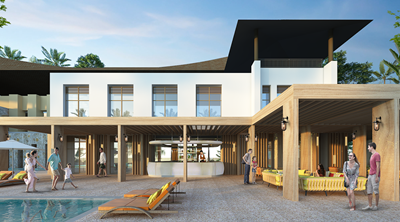 The refreshment project will see the all-inclusive resort reimagined as a family-friendly holistic wellness escape, with refreshed facilities and new services creating an invigorating and rejuvenating getaway. Catering to Australian tastes for holidays that combine stunning settings with pampering and wellness, the resort will offer families jaw-dropping natural beauty; unique experiences for body and mind; and delicious, healthy cuisine – served with a side of authentic Indonesian culture. Bintan Island, formerly known as ‘Pirate Island’, has a rich history thanks to its location along the India-China trading route – in the 12th Century it was a hideout for smugglers and pirates who plundered treasures from passing ships! The unspoilt tropical landscape of Bintan Island makes it easy to step back in time and unwind completely. The resort faces a private beachfront with clear blue water gently lapping at white sandy shores, lush green forests and hidden coves surrounded by rugged rocks and cliffs. Brand new wellness experiences will harness the natural beauty of the island to help restore balance. 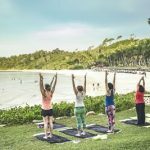 Guests will be able to enjoy family yoga by the sea at sunset and sunrise, stand-up paddle boarding and twilight trapeze. Other activities designed to promote relaxation and renewal include pilates, sailing, kayaking, tennis, water polo and beach volleyball. For those who find their zen in golf, the Ria Bintan golf course boasts a world class 18-holes with wide ocean-views, plus a 9-hole forest course where players can take a swing in a serene lake-side setting. Pampering for body, mind and soul is taken care of at the luxurious Hilltop Asmara spa*. Natural ingredients are carefully selected for their ability to relax, soothe and revive and indulgent treatments are designed to immerse every sense. The fresh new food and beverage offering at Bintan Island will tempt the tastebuds of travellers while providing healthy, nourishing fare. The bar will serve up made-to-order cold-pressed juices served beachside. A la carte restaurant, La Terrasse, specialises in fresh local seafood, while The Waterfall main restaurant features a wide selection of international cuisines. Bintan Island will retain Club Med’s famous all-inclusive packages, with gourmet meals, all-day snacks, alcoholic and non-alcoholic drinks included in the price. With abundant natural surroundings as a backdrop, Club Med Bintan Island will feature an elegant new design, blending nature, the unique culture and contemporary aesthetics to reflect the island’s beauty. Clean lines, clever use of lighting and natural materials create a sophisticated yet relaxed environment. The heart of the resort harnesses the concept of duality, playing on the shift from day to night, and outdoors to indoors, to create an ambiance that transforms in harmony with nature as the sunsets and rises. Guests can enjoy new spaces such as a healthy beach juice bar, an indoor/outdoor lounge with wood pergola and a new fitness centre with upgraded and additional equipment. Transformed spaces include the main lounge, swimming pool, restaurant, lobby and theatre with LED screen lobby. The wellness theme of the new Club Med Bintan Island extends to the Kids Clubs, which cater for tiny travellers from aged 2* to 17. Dedicated activities include circus school, a petit chef program and sand painting, plus new cultural experiences such as the creation of colourful tie-dye* patterns. “In recent years, we’ve seen that Australians are increasingly looking for holidays that are rejuvenating, and where they can be active but also spend time with their loved ones. That’s why we’re evolving the Club Med Bintan Island experience, to offer clients a wellness holiday that’s leaves them feeling restored and refreshed,” says Madeleine Clow-Suares, General Manager of Club Med Australia and New Zealand. Club Med Bintan Island reopens from 27 November 2016, with all renovations completed by February 2017.